“If you play with dogs, you have fun. If you swim with sharks, you get eaten,” said youth motivational speaker in his Amazon bestseller, BOOM! One Word to Inspire Action, Deliver Rewards, and Positively Affect Your Life Every Day. 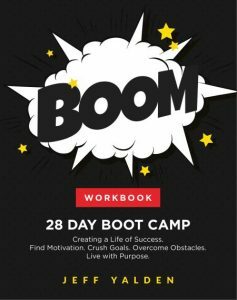 Yalden laid out the principles from BOOM into daily action steps in his brand-new workbook and planner, The BOOM 28 Day Boot Camp: Creating a Life of Success. Find Motivation. Crush Goals. Overcome Obstacles. Live with Purpose. The BOOM principles will change your life, and Yalden has been drilling down on each of the daily tasks for this blog. But remember: Only you can do the work necessary to create your life of success. Don’t forget: You are your associates. Yalden said that personal development guru, Jim Rohn, used to say that we are the average of the five people we hang out with the most. “If your tribe is full of complainers and naysayers, then it stands to reason that this negativity will ultimately rub off on you, robbing you of your effectiveness and taking you out of purpose,” Yalden said. We have all seen old married couples who seem to have morphed into the same person, telling the same stories and taking on the personality traits of the other. Be careful whom you choose to spend time with. “If your circle of friends brings you down, it’s time to make a change. If that change means changing your circle of friends, then change your circle of friends. Part of your self-esteem and fulfillment comes from being of value to others, so remember – it’s not just about what people can do for you, but also what you can do for others. Develop this close circle of like-minded comrades. Keep in touch with loved ones but don’t become a guest at anybody’s pity party. Connect often with people that are most important to you, and don’t forget to be of service to others. Sometimes we need to close our circle. We need to take out some of the negative energy – and leave in the people that are supportive and encouraging – the people that have our backs. Identify your circle of friends. “If I were to give you a dollar, would you rather have four quarters or 100 pennies? You probably said you would rather four quarters. Why? Less is more, my friends,” Yalden said. Sometimes if we have too much, we get overwhelmed. We get sidetracked. No drama. Identify your close circle.